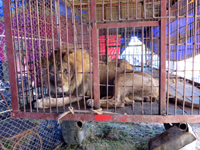 Animal Defenders International : Animal rescues : Lions rescued from circuses in South America to go home to Africa! 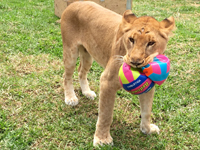 Lions rescued from circuses in South America to go home to Africa! Thirty-three lions rescued by Animal Defenders International (ADI) from ten circuses in Peru and Colombia are to go home to their native Africa in the biggest ever airlift of its kind. After suffering years of confinement in barren cages and a brutal life being forced to perform, the lions are heading to huge natural enclosures at Emoya Big Cat Sanctuary in South Africa. 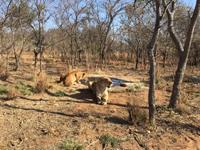 Help us get the lions home to Africa! The airlift in October will be the culmination of ADI’s work with the governments of Peru and Colombia to eliminate the use of wild animals in circuses. ADI evidence of the abuse of circus animals in Latin America led to legislation banning animal acts and then ADI stepped in to help enforce the laws. Working with the Peruvian wildlife departments SERFOR and ATFFS, as well as the police, our year-long Operation Spirit of Freedom mission has seen ADI raid circuses all over the country. We have faced violent confrontations, travelled thousands of miles, and journeyed across the Andes with our rescued lions. Some circuses went underground as the raids commenced, but were eventually caught. (pictured right: Kala having fun in the ADI rescue center in Peru where the lions’ rehabilitation has begun. Over ninety animals have been rescued during Operation Spirit of Freedom, with ADI also providing assistance to the Peruvian authorities on the issue of wildlife crime. More than 50 native wild animals – including bears, six species of monkeys, coati mundis, kinkajous and a puma – have or will soon be relocated to two Amazon sanctuaries as part of a huge ADI-funded construction programme. Nine ex-circus lions from Colombia will be joining the 24 lions from Peru on the flight to South Africa, the first big cats handed over following the country’s ban on wild animal circuses. Taken into care by the CDMB regional wildlife authority in Bucaramanga, ADI took on this responsibility until the flight was finalised. ADI originally planned to take the lions to sanctuaries in the US, but the opportunity to rehome them in their native Africa arose and could not be missed, so plans were immediately put in place to make it happen. Moving the lions to Africa increases the flight costs but it is the ideal home for the lions and we know it is the right thing to do! ADI is chartering a huge Boeing 747 to transport all 33 lions with an ADI veterinary team direct from Lima to Johannesburg. Until their flight the lions will remain at the ADI Spirit of Freedom Rescue Centre near Lima, Peru, where they will continue their rehabilitation under ADI veterinary supervision and enjoy their grassy play pens, but the best is yet to come! ADI now has all the permits in place to fly the 33 lions ADI has rescued from circuses (pictured left one of the lions before being rescued from the circus) in Peru and Colombia home to a new life in a safe sanctuary in South Africa – Emoya Big Cat Sanctuary (pictured right). To fly the 33 lions home will cost $330,000/£230,000, for the flight – $10,000/£7,000 ticket for each lion! Timing is critical, with the price based on where the aircraft is, the day before we need it – e.g., if it comes from Canada it would cost much more than if it came from Chile. So we’ve given the cargo companies as much notice as possible and need as many options as possible. Our travel crates are ready but there’s a lot to do! Another flight is needed to bring the nine lions from Colombia to join the 24 Peruvian lions on the flight to South Africa. Dozens of trucks will be used to transport the lions to and from flights in Colombia, Peru and South Africa. Police and customs will be involved and these are Government law enforcement operations, so there will be extra oversight. The size of the operation and cooperation needed from government officials and airports rules out the Latin America Easter holiday period in March, as well as Peru’s Presidential election period in early April. We can’t wait to get to Africa with our beautiful lions, but we also have to get it right! We believe we are close to confirming a flight in April. Our thanks to everyone who has helped get us this far. This has not been just one rescue – this is multiple rescues and over 100 animals rescued. In the 5 months we have waited for the permits from Colombia, Peru and South Africa, it has cost ADI over $100,000/£70,000 just to care for the lions in our temporary facilities. Now it’s time to send for the lions to go home. So please give what you can.